Join Mickey and Friends on a magical journey through 12 beloved Disney realms, from Radiator Springs and Alice’s Wonderland to Peter Pan’s Never Land and Pooh’s Hundred Acre Wood. Along the way, search for hidden treasures – there are over 1,000 things to find! Race to the end of the giant 6-foot game board before the clock strikes midnight to win! 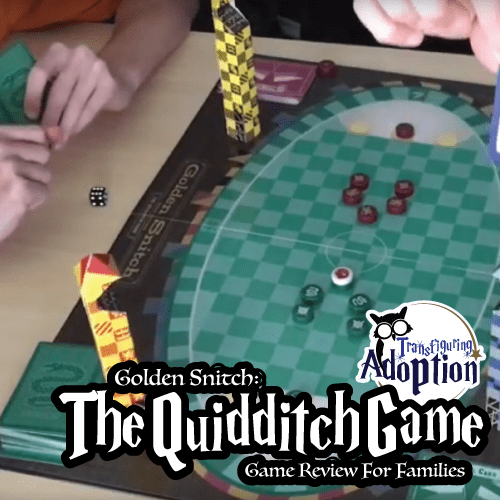 Our family was interested in this game because it appears to have minimal reading involved – which is great for foster or adoptive families that have kiddos who have a difficult time reading. This game is Chutes and Ladders meets Where’s Waldo. As the description states above, you will be moving your Disney token along a game path and hopefully landing on a shortcut or two so that you can quickly advance to the finish before the clock on Cinderella’s castle strikes midnight. Periodically during the game players will be asked to search for items amongst the intricate drawings on the game board. After having played the game several times and with a varying mix of ages (elementary school all the way to senior citizen) this game overall seemed to have some great elements working for it and helping you to achieve your goal of bonding with your family. 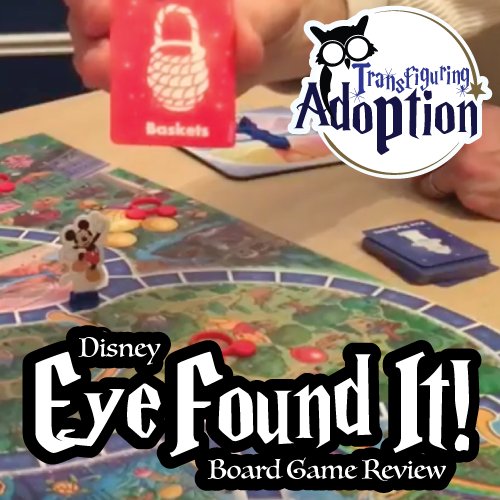 Most people are going to recognize at least a few of the Disney characters represented on the game board. They did a good job of incorporating various generations of characters from Cinderella and Peter Pan to Phineas and Ferb. Unless you count reading the instructions, there really is no reading involved in this game. Again this levels the playing field for all people in the family despite their reading level. At various points in the game you will be asked to search for objects pictured in the game. All players work together on this activity and all players receive the same amount of bonus moves as a result of the hard work. Everyone in our family really enjoys looking for the items when we are asked to search the images on the board. Frequently as we are just getting excited about finding a could of the objects – the time runs out. Our family began allowing the timer to be flipped twice so we can have more fun searching for items as a family. It seemed that the pointer on the spinner frequently flirted with the line between two selections. This gives ample opportunity for kiddos to have arguments about whether the spinner landed on this space or that space or on the line. We suggest talking about the rules for the spinner ahead of game play time to avoid arguments (possibly announce that the adult on duty is the judge and has the final say on the spinner). Overall, this game seemed to be a winner for a our family. It gave us something to focus on together for 15 to 20 and gave us a fun experience to talk about for the rest of the day. Again, this game appeared to appeal to our youngest child, our teenagers and even grandmas enjoyed playing. We would love to see what your family thought about this game.